Juliet Schor is Professor of Sociology at Boston College. A graduate of Wesleyan University, Schor received her Ph.D. in economics at the University of Massachusetts. Her most recent book is Plenitude: The New Economics of True Wealth. She is also author of the national bestseller, The Overworked American: The Unexpected Decline of Leisure and The Overspent American: Why We Want What We Don't Need. The Overworked American appeared on the best-seller lists of The New York Times, Publisher's Weekly, The Chicago Tribune, The Village Voice, The Boston Globe as well as the annual best books list for The New York Times, Business Week and other publications. The book is widely credited for influencing the national debate on work and family. The Overspent American was also made into a video of the same name, by the Media Education Foundation. Schor also wrote Born to Buy: The Commercialized Child and the New Consumer Culture. She is the author of Do Americans Shop Too Much?, co-editor of Consumer Society: A Reader and co-editor of Sustainable Planet: Solutions for the Twenty-first Century. Schor is currently working on issues of environmental sustainability and their relation to Americans' lifestyles and the economy and the emergence of a conscious consumption movement. She is a co-founder and co-chair of the Board of the Center for a New American Dream, a national sustainability organization. Visit her at www.julietschor.org. "Juliet Schor's writings have had a huge influence on me for years. The New Economics 101 now makes Schor's work even more accessible. For those who still think we have to choose between a healthy economy and a healthy environment, watch this video! Schor lays out an inspiring, realistic, common sense approach to having both - and having way more fun in the process. An excellent watch!" "The innovative work in economics today is actually being done in the field of sociology. Boston College sociology professor Juliet B. Schor's New Economics 101 is a case in point. Against the tide of mainstream thinking that juxtaposes growth vs. austerity in a zero-sum game, Schor charts out a bold four-point course to a more sustainable and ultimately satisfying future. The New Economics 101 presents a rational, timely case for how we might realize not just the true wealth of our nation but of our entire planet." "When it comes to confronting issues like climate change and inequality, economists often seem to turn a blind eye. Not Juliet Schor. Her ideas are timely, innovative, compassionate, and unlikely to be popular among economists. And that's exactly why they deserve serious consideration. 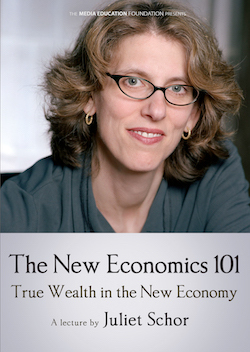 The New Economics 101 presents Schor's smart and provocative ideas in an engaging and accessible presentation. Highly recommended for all who want to be inspired!" "Professor Schor articulates a new paradigm that challenges the mantra of indiscriminate growth and more stuff. At its core is the reduction of work time, with a twist. In addition to redistributing jobs, a common rationale historically, work-time reduction is a means to address climate change and free time for potentially satisfying non-market and small-production, low-impact alternatives. Consume less, produce less, use fewer resources, work less. Under 'business as usual,' this is a formula for economic collapse. According to Schor's 'plenitude,' this is the way to avoid environmental collapse and to 'true wealth.' Conventional wisdom sees a weak recovery after the Great Recession. In these perplexing times, however, Professor Schor sees opportunity to create a new economy based on different assumptions. Her analysis, which has built up over her many publications and is condensed in this lecture, is compelling -- and hopeful, because, as shown in this video, small-scale examples of the new economy already exist."